American craft beer brewery The Boston Beer Company has kicked off 2015 with a brand new seasonal beer: Samuel Adams Cold Snap. A Belgian-style white ale, the new Cold Snap beer is made with wheat and ten different kinds of fruit, flowers and spice, including orange, plumb, ground coriander, hibiscus and anise. Hallertau Mittelfrueh hops have been used to balance the wheat and spices. With an ABV of 5.3 percent, the seasonal brew is a medium-bodied yet refreshing ale with a complex floral, spicy aroma and character. Traditionally, white ales are brewed with a variety of spices – most commonly orange and coriander. However, Samuel Adams incorporated a much wider range of ingredients from around the world, including places like West Africa (Grains of Paradise), Turkey (anise), Egypt (hibiscus) and India (tamarind), as well as the US (fresh-ground coriander from California). The Boston Beer Company says it was brewed with spring in mind, as American beer drinkers transition away from the hearty, darker beers of winter to the bright, lighter-bodied lagers and wheat beers of summer. Company founder and brewer Jim Koch said that craft beer makers, like chefs, are inspired by the weather, changing seasons and the availability of fresh ingredients. However, spring was a challenging season to brew for, as people eagerly anticipate winter to end and the beginnings of summer. 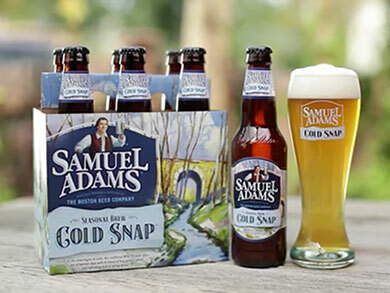 The Samuel Adams Cold Snap seasonal craft beer will be available across the United States from January until mid-March 2015. Founded by Jim Koch, who discovered a generations-old family beer recipe in his attic and was inspired to give brewing a go. Pleased with the results, he set about setting up The Boston Beer Company. Today the company brews more than 50 styles of beer. The Boston Beer Company topped the list of the top 50 craft breweries by sales in 2013. It was ranked fifth of all breweries for sales in America in 2013. The company’s best-selling beer is Samuel Adams Boston Lager. Sam Adams Cold Snap. Best beer ever.